We gave in and hired a car today – smart move, SMART car, for 30 euros a day, in a bid to reach one of the 7 Natural Wonders of Portugal – Sete Cidades. We packed sandwiches, cobbled together from the bland breakfast buffet at the hotel, and headed off into the hills in search of memorable sights. We were not disappointed. 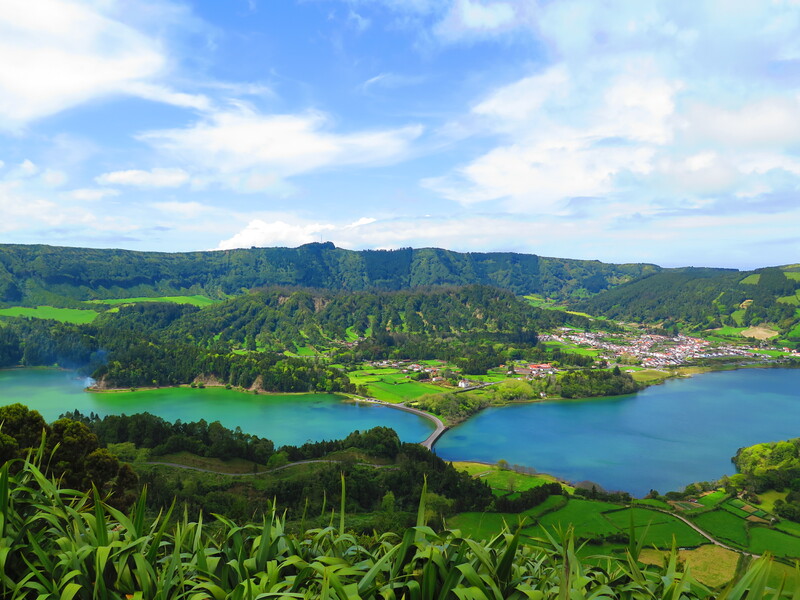 The drive towards the famous Sete Cidades takes you along wonderful windy country roads, with several viewpoints, each more dramatic than the last. One in particular, stands out, and is the one that gives you the first complete view of these mystical and beautiful lakes. The Green and Blue Lakes, which according to legend, were formed from the tears of a shepherd and a princess who shared a forbidden love, are set in a crater some 5km in diameter. The surrounding greenery and blue sky frame the lakes beautifully, and Vero and I spent almost an hour at this viewpoint, in awe at the wonder of nature. We drove down to the lakeside, to the green lake to begin with, and strolled around the lake’s edge, full of ducks and bullying geese who were chasing after the ducklings, people on leisurely boat rides, others paddleboarding….it was a very pleasant place to while away some time, and we sat down and enjoyed our sandwiches taking in the peaceful scene. From here we drove to the Sete Cidades village, which has a pretty church, and stopped for a coffee and an ice cream at a local cafe, before we headed to the blue lake to take in the view. You can rent kayaks here to explore the lake, but we were content just to sit and soak in the day. From here we followed signs to the Vista Do Rei, and though we didn’t quite make it, we were still able to see the lakes from a different angle on the dirt track walk. At the other side of the dirt track, you see green fields that drop off as sheer cliffs into the Atlantic….it’s quite a contrast. We headed further down towards the coast, and came to the pretty village of Mosteiros, which is characterised by rock structures forming natural pools, and impressive sea cliff views. We spent some time hopping over the rocks, the natural pools deep and inviting, and the views fantastic. Back in the car we drove to a place called Ferreira, down an impossibly steep cliff-side road to a little white house which was a restaurant, bar, sauna and spa rolled into one, with an outdoor thermal pool. Vero got in and enjoyed a swim in the warm pool – a pool in one of the most picturesque places one could imagine, towering green hills behind, the endless ocean in front. I walked down the rocky path to the sea, where there are more natural pools formed by the rocks. These, too, are warm, and one or two were having a swim, though the waves crashing over were a bit strong to relax comfortably. Vero got out and we had a beer overlooking the ocean to finish the spectacular day, before driving back to Sao Miguel via the hotdog stall in Ponta Delgada again, and via Uksame cafe for a delicious apple pie. We’d had the best day of our trip so far, and I had clear images of the green and blue lakes in my eyes as the waves outside lulled me to sleep….this much nature is exhausting, but good for the soul.